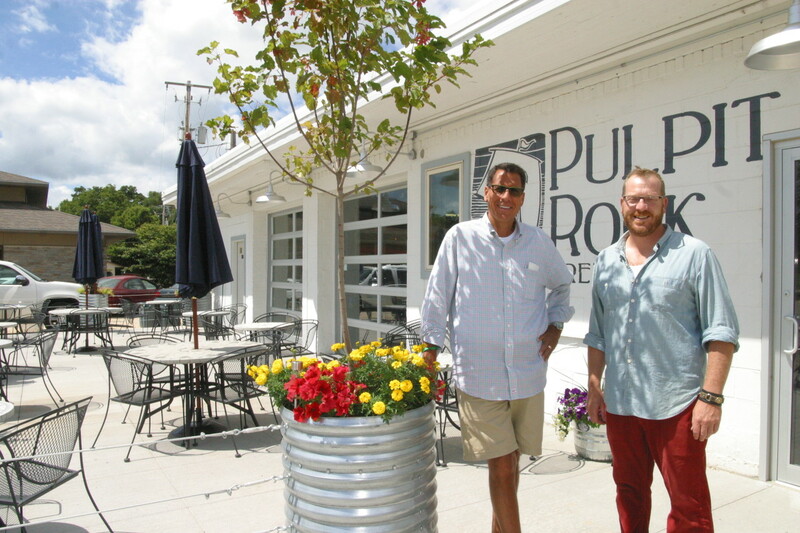 Pulpit Rock Brewery | Winneshiek County Development, Inc.
Family businesses are common in historic small towns like Decorah, Iowa, but genealogical roots don’t automatically sprout functional business plans, says Pulpit Rock Brewing Co. co-founder and chairman Pete Espinosa. The idea for the craft brewing company came together over a Tollefson family vacation in 2013. Espinosa and three in-laws, all of them Luther College grads, put their experience in entrepreneurialism, finance, and marketing to work, investing in Decorah’s growing reputation as a hip and healthy destination. Their biggest challenge? Building a brand loaded with local personality, even with each of them working careers elsewhere. After a year of licensure tedium — Espinosa himself shepherded the application through federal offices in Minnesota and Ohio — Pulpit Rock Brewing Co. launched its own craft beers in fall 2015. Their brewing headquarters and a tasting room, in a retrofitted garage on 5th Avenue, near College Drive, are open all week. On any given day visitors will find six to nine brews on tap, from a signature pale ale to a coffee-infused Pour-Over Porter, for example. Staff members know their beer and have decades of combined experience, including a bevy complementary skills: Co-head brewer Robert Slack, a West Union native, went to culinary school and often scrutinizes brews with such a finicky palate that others have to talk him down from dumping whole batches. His cohort in brewing, Justin Teff, grew up in nearby Dorchester, and is an accountant. And manager Tyler Uetz is a veteran of the Des Moines food industry, working the busiest high-end bars both as a talented server and administrator. Together staff come up with a winning name for each beer — such as “James Blonde” — and often file their cleverness with the United States Patent and Trademark Office. Rather than scale the business by selling greater volume across wider distribution, the company sends limited product to a select few tap rooms in Iowa’s city centers (see pulpitrockbrewing.com/find-us). The goal, says manager Uetz, is to bring patrons to the source, providing them not only with great beer but a connection to the good-natured, hard-working, slightly Norwegian-nutty community that made it. “I look to consistency of positive reviews on Square, TripAdvisor, and Yelp,” he says. “We want to hit the mark in craftsmanship and in quality of environment and experience” — which includes a tasting room steeped in meaning. “Pulpit Rock” is not only a Decorah landmark but a 1,981-foot outcropping overlooking Lysefjorden, a glacier-cut fjord near Stavanger, Norway, Espinosa’s mother’s hometown. An arresting image of the promontory dominates the wall that divides Pulpit’s tasting room from the sparklingly sanitary brewing facility. 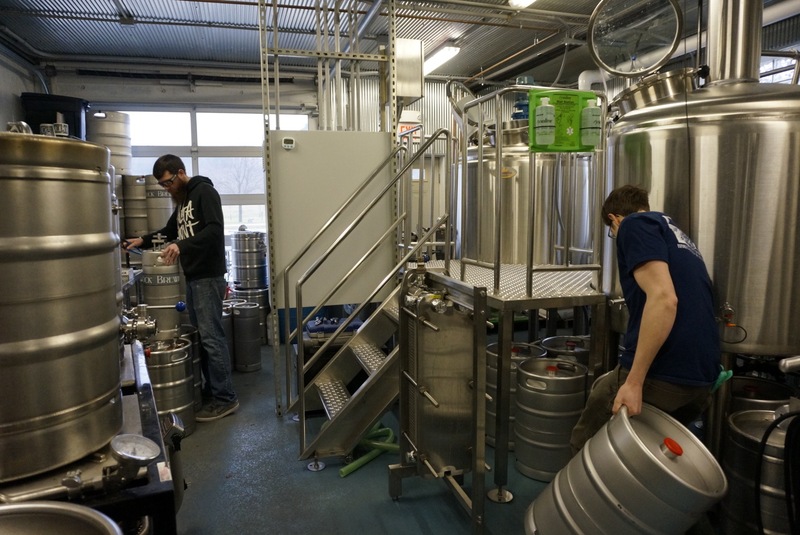 Through inset windows, patrons can watch Slack and Teff at work, whether they’re filling kegs, transferring beer between towering tanks, or cleaning a sea of stainless steel equipment. “1981” — the height of the company’s namesake — is also the year Espinosa graduated from Luther. “When I came upon that piece of providence, I knew this business was meant to be,” he says.